Baruch Schnurmacher the father of Zoltan was born in in Gyor on 16 Nov 1892. He was the son of Lipot Schnurmacher and Leni Erenthal. Interestingly, there was another Schischa-Schnurmacher marriage that took place much earlier than the one mentioned by Meir Deutsch. This one took place between Hindel Schischa and Gerson Schnurmacher. about 1795. There does not appear to be a relationship between Gerson’s Schnurmacher family in Mattersdorf and Baruch’s in Gyor but anything is possible. Trauer und gleichzeitig Wut über die Zerstörung jüdischer Kultur in Österreich. Und noch mehr Wut über die Zerstörung jüdischen Lebens in Österreich und in Europa. 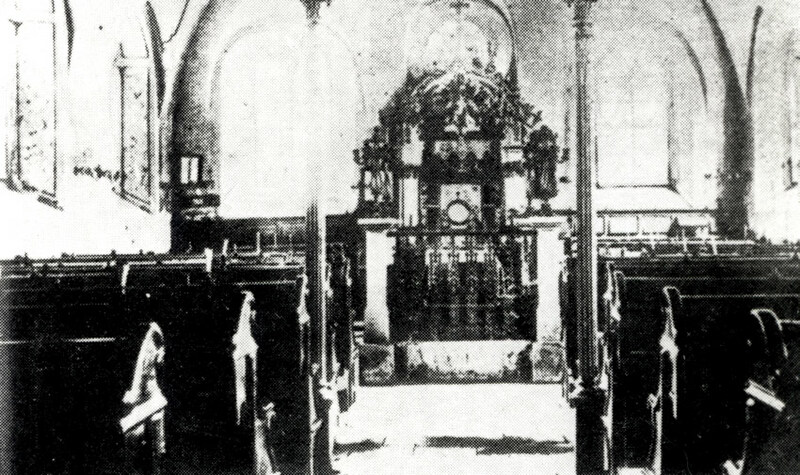 The Jews wanted that their Synagogues should not be similar to churches and put the BIMA in the center of the Synagogue. Then came the Neolog stream that wanted to move the BIMA to מזרח (to the eastern part of the Synagogue), toward the Holy Ark (ארון הקודש). That and some other changes that the Neolog leaders wanted to introduce, started another split (after the split of the Reform movement of Hamburg and Berlin) in the Jewish community – Orthodox and Neolog. Matterdorf was an Orthodox Community. I wonder where the עזרת נשים Frauenschul (Weiberschul) was. Grunwald says that there were no windows in the Ladies Gallery. 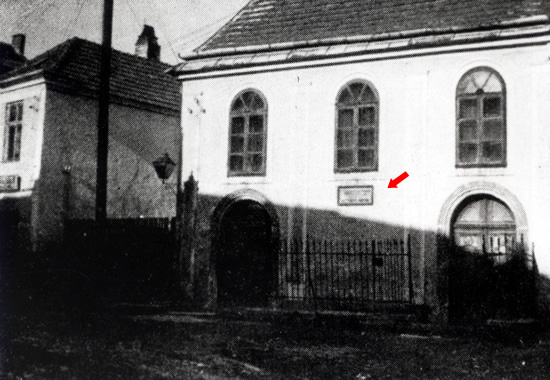 If so, then it seems that the gallery was under the Synagogue’s slanting roof. Thank you. 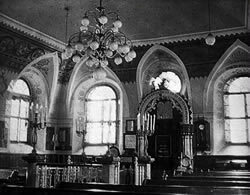 I have looked at many of the interior pictures of the Synagogue. They are all of very poor quality and unclear. I have found one in BETH HATFUTZOT which is quite good. You can see on it some of the decoration painted. The picture is dated 1931, some years after Grunwald’s article (the same picture is on the cover of Samuel Hirsch’s book זכרונות מקהילת מטרסדורף וחורבנה). In that picture I could not see a large Menora. On the four corners of the Bimah were large candelabras and no iron bars that formed a „Crown“. As I said that picture is from 1931. Grunwald’s article was published 6 years earlier. Looking at another picture – Postcard „Tempel – Inneres“ (very unclear) I could see something coming out of the 4 stone pillars to form a „Crown“ over the Bimah. It is surprising that just in such a short time the interior of the Synagogue changed so much. Sent the picture of 1931 to Johannes, as his e-mail address is the only one I know. As I said that is the best picture of the interior I saw. There you see proper seats in rows and not benches and „Staendern“. Even in the earlier picture (from Gold’s book) there are (as you said) already proper seats. If you read a bit further in Grunwald you would see that he writes :“Fuer Chanukkoh, wo man sie [die Menorah] vor dem Oraon anzundete…“. From here we see that it was a Hanukkah Menorah, therefor an 8 armiger, or 9 armiger if we count the Shamash. sie auf dem Almemor brannte, wurden Wachskerzen verwendet“ (a.a.O. S. 418). War es also eine Chanukkiah, wie erklärt man dann, dass sie (auch) an „Sabbaten und Festtagen“ angezündet wurde? Oder stand in der Synagoge ein 7-armiger Leuchter (was nicht die Regel, aber sehrwohl möglich ist), der an Chanukkah mit einem zusätzlichen Arm versehen wurde? Oder war es vielleicht ein Leuchter mit 8 Öllichtern (für Chanukkah) und zugleich einer Steckvorrichtung für 7 oder weniger Kerzen für Shabbat? Und was soll man sich eigentlich unter der „Ölersparungsvorrichtung“ vorstellen (evtl. eine Vorrichtung zum Auffangen des Öls)? Die Sache bleibt, soweit ich sehe, in jedem Fall unklar – ich habe mich für eine der vielen möglichen Varianten entschieden und „7-armiger Leuchter“ angemerkt (auch um die Sache nicht unnötig zu verkomplizieren, schließlich ging es ja mit obigem Zitat nur darum, eine ungefähre Idee zu geben, wie der Innenraum beschaffen war), gestehe aber gerne ein, dass der Leuchter vielleicht auch 8 Arme hatte oder 9 oder vielleicht 7 (Kerzen) und 8 (Öl) oder 7 und 9 oder 6 und 9 etc. « Mittelalterliche jüdische Gemeinde in Mattersdorf?